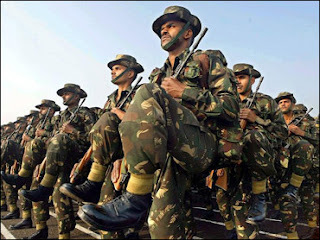 Indian Military Ranks are structured according to British System. In India, only two Field Marshal's baton has been awarded since it became Independence, there hasn't been any Admiral of the Fleet nor Marshal of the Air Force. Indian cavalry uses traditional ranks like lowest Army enlisted rank is "Sepoy", but the equivalent rank is sowar. Indian Army has eliminated the rank of 2nd Lieutenant. In India officers do not command platoons- Naib Subedars. The unit commander appoints two other ranks: Company Havaldar Major and Regimental Havaldar Major. These ranks are senior sergeant ranks for the supply services. Indian Army rules are ranks up RHM(Regimental Havildar Major) are selected by the Commanding Officer. Every Company has 15 Lance Naiks, 10 Naiks and 5 Havildars. The senior most two Havildars are Company Quater Master Havildar and Company Havildar Major. CO has all the rights to promote or demote any of these ranks with valid reasons. At regiment level, two senior Havildars are promoted to Regimental Quater Master Havildar and Regimental Havildar Major. The rank of Quarter Master Havildar used to be there in every regiment and not just in supply units. Today, however, the Quarter Master Havildar is slowly being removed. The rank of Quarter Master and Havildar Majors are just appointments. They receive only the pay and perquisites of a normal Havildar. For their extra work, they generally get appointment pay, in the range of Rupees 75 to Rupees 200 per month. If the RHM or CHM has to change his unit, there is every chance he may lose the Havildar Major status. For example, when a Havildar joins a National Cadet Corps unit, he may become a Havildar Major, but when he goes back to his unit, he becomes Havildar again. Havildar Majors and Quarter Masters are not a separate rank. It is just an appointment, which can be cancelled any day.